The architect, Robert W. Hill and designer, George E. Bissell strove for individuality- no soldier at rest standing on a plinth- for this duo. Instead, the 63’ Gothic Revival tower with castellated parapets recalls the age of chivalry when villagers responded to calls from their lord to protect the demesne and the outlying village. The bronze soldier, far from being “at rest” stands on a tourelle, well above the roofline, vigilantly watching for invaders. 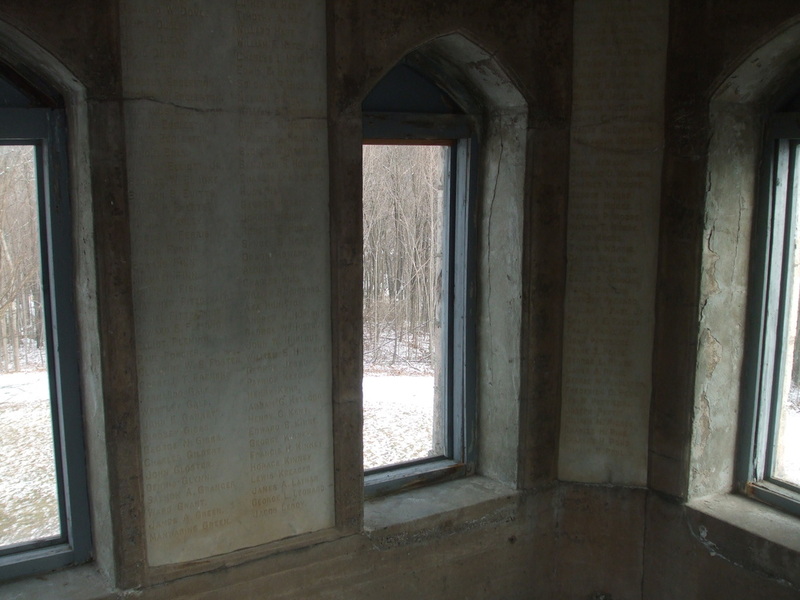 The distinctive stonework of the monument had a “pinkish” cast at the time it was quarried from the property of Stephen Hurd, a local farmer at nearby Highland Lake, it now appears golden. The masonry and carpentry was also contracted to local artisans. 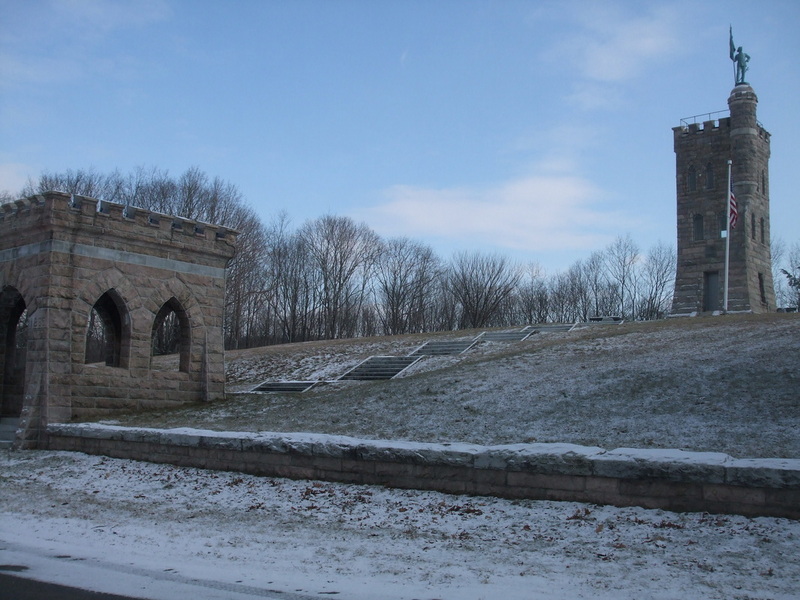 The CHS reported that “the design, materials, and craftsmanship of this exceptionally fine and little-known work all attest to the remarkable artistic and practical resources of provincial Connecticut.” The National Register of Historic Places agreed adding the monument to its list on January 26, 1984. The park, located on what had formerly been known as Camp’s Hill is about 2 acres above the city of Winsted. The CHS states that the designer of the monument “In working out the relationship of site, building mass, and architectural style … used the wall along the front of the site to knit the components together. The stone fence with its fanciful central entrance structure establishes the site as an integral part of the memorial as a whole.” However, the historical record does not bear this out chronologically. 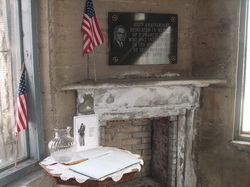 On the first floor, surmounting the fireplace in the northeast corner is the 1990 plaque commemorating the fundraising campaign of P. Francis Hicks that resulted in monument repairs and the establishment of the Soldiers' Monument Commission. Nearby, on the east wall, is the wall-size marble dedication plaque. All three floors are 15' x 15'. A wooden stairway rises against the south wall of each floor. On the second floor are five plaques listing the more than 300 men who "represented" Winchester in the Civil War (current research has found that not all were residents of the town but most had enlisted there). The third floor is similar to the second but without plaques. Historical exhibits are often displayed on this floor during the seasonal open house events, and visitors thrill to the views from the windows. A stairway leads to the roof which is currently off-limits to visitors for safety issues until renovations can be completed. At Christmas, a lighted tree on the roof may be seen for many miles.